Preheat oven to 375°F (350°F for a dark or nonstick pan). Grease and flour (flour bottom only) a 10-inch square baking pan and set aside. In a large bowl or bowl of a stand mixer, stir together sugar cookie mix, butter, flour and egg until just combined. Place batter evenly in the bottom of prepared baking pan, using a spatula or your fingers to flatten the surface. Bake crust 10 minutes or until edges are just light gold and batter is set (it will not be fully baked through). Remove from oven and set aside to cool. Meanwhile, in a medium saucepan over high heat, bring cherries, ginger, sugar and cornstarch to a boil. Reduce heat to a simmer and cook, stirring occasionally, until mixture is thick and reduced, about 15 minutes (you should end up with about 2 1/2 to 3 cups of filling). Remove mixture from heat and let stand 10 minutes; pour filling evenly onto crust and let set 20 minutes. Meanwhile, make the lattice crust: Unroll pie crust onto a well-floured surface and, using fingers, shape into a 10-by-10-inch square (just do the best you can; it doesn't need to be perfect). Using a sharp knife or pizza cutter, slice square into 14 even strips. Place 7 strips 1 inch apart on a piece of parchment paper. Starting with the outside strip, lift the bottom edge of every other strip and bring it to the top edge so it's folded in half. Take one of the remaining 7 strips and place horizontally over the middle of the strips on the parchment paper. Unfold folded strips over horizontal strips. Lift the bottom edges of the strips that were not folded over before and bring them to the top edge so they're folded in half. Take another one of the remaining strips and place it 1 inch below the horizontal strip. Unfold folded strips over horizontal strips. Repeat with remaining strips until you have a full lattice crust. Place crust and parchment paper on a baking sheet and place in freezer to stiffen. Heat oven to 350°F. Place stiffened lattice top on filling, trimming edges as needed so it sits nicely on top of filling. Brush quickly with egg wash and sprinkle with coarse sugar, if desired. Bake for 30 minutes or until lattice top is a light golden brown and filling is bubbling. Remove from oven and cool completely on a cooling rack before cutting. Nothing is more American than a classic cherry pie. 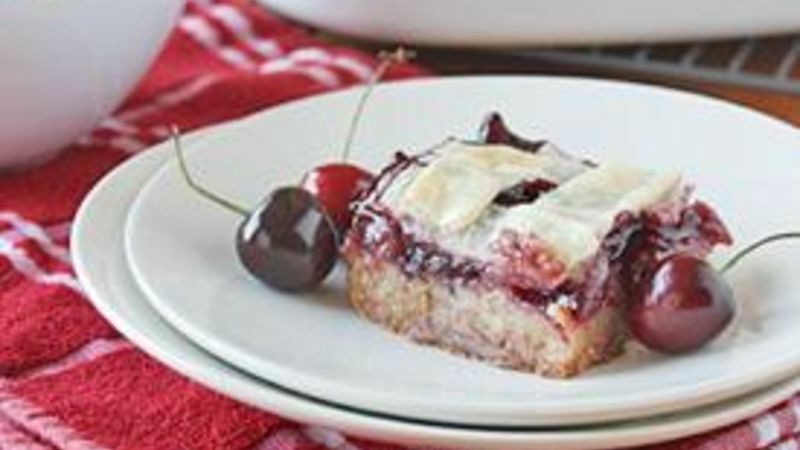 Anywho, these Lattice-Topped Cherry Pie Bars are my new favorite way to enjoy the classic pie. With a sugar cookie crust, sweet cherry filling and a buttery (and pretty) lattice pie crust topping, it’s the new way to share pie with your friends and family. First, prepare Betty Crocker Sugar Cookie Mix according to package directions for roll-out cookies. Spread the batter evenly into the bottom of a greased and floured square baking pan. Use a spatula or your fingers to make sure the surface is smooth and even. Bake the crust just until it’s set and very lightly golden. We don’t want to bake it completely through because it’s going back in the oven later. Make the cherry filling, let it cool a bit to thicken, then spread it evenly over the crust. Let that hang out for a bit while you make the lattice top. Unroll a pie crust onto a well-floured surface and gently press the crust into a 10-inch square (don’t worry if it doesn’t turn out into a perfect square; just do the best you can). Using a sharp knife or pizza cutter, slice the crust into 14 even strips. Place 7 strips onto a piece of parchment paper and fold every other one over itself, like so. Take one of the remaining strips and place it horizontally in the center of the strips on the parchment paper. Unfold the folded strips over the horizontal strip. Fold over the other strips and place another remaining strip horizontally across the strips on the parchment paper. Unfold the folded strips over the horizontal strip. Repeat the process until all the strips are used up and you’ve got a fancy-schmancy lattice pie crust. Place the pie crust and parchment paper on a baking sheet and freeze it until it stiffens a bit so you can transfer it well. Place the stiffened lattice top on the cherry filling and trim the edges so it fits nicely on top. Brush the lattice with egg wash and sprinkle with coarse sugar, if you want. Now, bake it all until it’s nice and golden brown and the filling is bubbly. And now, commence the eating.